Little to summarize here. Sprinkles or very light showers occurred on 4 days and produced a total rainfall of 0.02 inches. There were three mornings with cold low temperatures - two days with 32 F and 28 F on March 1st. Shown below are the current monthly outlooks for April and also the latest update of continental drought status. The forecasts for April indicate more of basically the same. The drought chart indicates California improved some due to recent rains around Santa Barbara and north of LA Basin. However, extreme drought spread toward southwest Arizona and inched into southeastern corner of California. First Modern Tornado Forecast Made 70 Years Ago. Another tornado actually struck the base during the late afternoon of March 25th, after the forecast had been made and the base took actions to prepare for sever storms - see photo above. The two articles linked just above were prepared for the Symposium held at the University of Oklahoma commemorating the 50th anniversary of this historic event in weather-forecasting history. Outlook appears bleak for runoff in Colorado, Rio Grande, and Arkansas River Basins. A 500 mb trough will linger over the Southwest for next 96-hours or so. Above is from 00 UTC last evening and shows the GEFS mean 500 mb heights for 48-hours (26 March 5 pm MST) and below is same but for 96-hours (28 March 5 pm). Second below is from 06 UTC GEFS forecasts last night - shown are the plumes for PW at TUS. During a windy afternoon today PW plummets to very low values and and basically is forecast to stay low for rest of the month. Bottom shows 00 UTC WRF-GFS forecast for precipitation (on 5.4 km grid) through 5 pm on March 31st - a very dismal forecast except for a few mountain peaks over northeastern Arizona. While T. S. Eliot said that April is the cruelest month, that usually doesn't apply here in Arizona. So, we'll be moving ahead toward our first 100 F day (note that temperature at TUS reached 91 F on Thursday afternoon). Last week we took off on a short road trip to New Mexico. The winds were nasty both on our Monday, March 12th departure and, especially so, on our return on Thursday, March 15th. Map plot above is for 3:00 pm local time on 15 March and is along I-10 in southwestern New Mexico (from MesoWest). There are obviously some problems with directions reported but the wind speeds were in the range of 40 to 60 mph. When we departed on Monday the winds, from the east, were quite strong as soon as we passed the high point between Tucson and Benson. There was some dust and tumbleweeds, and I estimated a nasty, cold wind at the New Mexico Visitor Center on west side of Lordsburg to be gusting 40 to 50 mph. However, the winds on Thursday caused serious problems due to dust storms that closed I-10 for over four hours. The Arizona DOT (or Highway Patrol) was doing a serious disservice to stranded motorists, putting out a statement that the interstate would be closed until 2:00 pm (which - of course - is about when one would expect the strongest winds to be in play, and they were). The interstate was eventually reopened between 4:00 and 5:00 pm. We decided to turn south toward Hachita, rather than sitting in Lordsburg for hours. Our plan was to head west through Rodeo and then Portal and drive over the Cirichuahua Mountains - this is something we've been hoping to do - eventually returning to I-10 at Wilcox, Arizona. However, we learned the hard way that there is no gas available at either town to the east of the mountains. I didn't feel we had enough gas to get over the mountains, and so we limped slowly south to Douglas, arriving at the first Douglas station with just a whisper of gas. So much for our Chirichuahua plan. The rest of trip went very well. We spent two nights at the Plaza Hotel (above) in Las Vegas, New Mexico. The NetFlix series, Longmire, was filmed in and around Las Vegas and has produced a significant tourist draw. I had also learned that the United World College - USA Campus was a bit west of Las Vegas in the small village of Montezuma. This is a unique two-year, tuition free, college that hosts a small number of 17-19 year-old students from around the world. It is a closed campus with only a few tours each year, but seeing their main building (below) was worth the drive. The restored hotel is called the Montezuma Castle (Hotel). 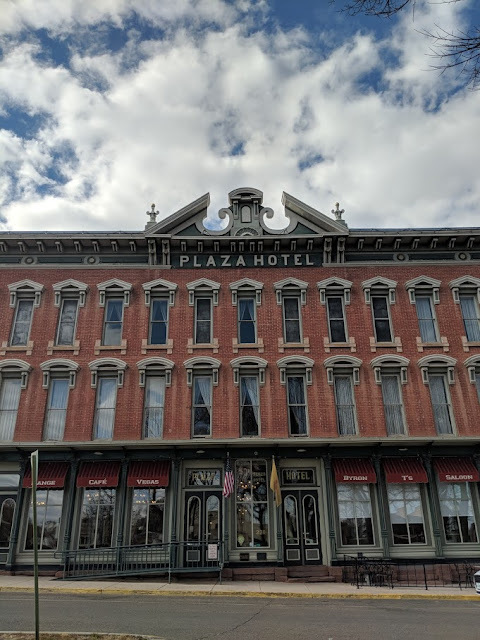 It began life in 1886 as a Fred Harvey Hotel (the Atchison, Topeka, and Santa Fe railroad had a short spur line to Montezuma because of the well-known hot springs there). The light sanctuary is a special campus building that is open to visitors. 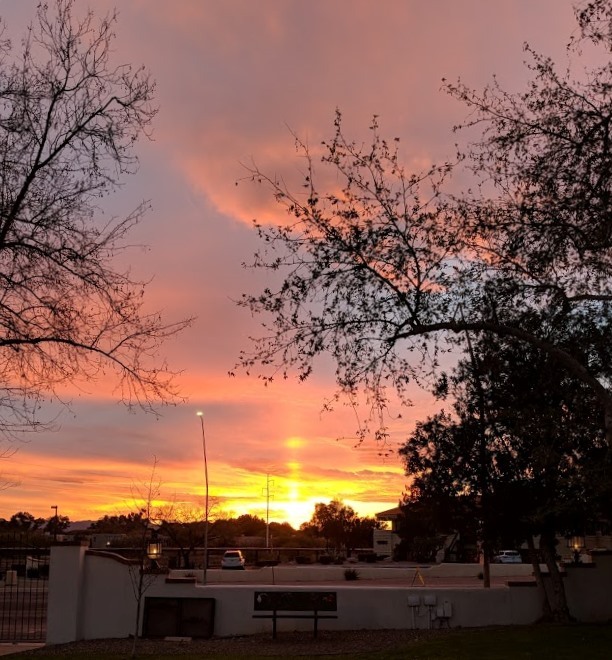 This structure is essentially a work of peaceful art that creates a meditative environment that uses numerous prisms to capture the moving light as the sun crosses the sky. It is really quite beyond description. We visited the Pecos National Monument (above) - along the famous river and just outside the village of Pecos. The ruins shown are of the final Spanish Missionary Church that was constructed there. The early ruins are mostly just remnants of the walls and foundations of the large pueblo that was there. There are a couple of Kivas open for visitors to climb down into. We also visited Petroglyph National Monument on the west side of the Rio Grande at Albuquerque (below). The park is a difficult visit for the less nimble visitor (as per us), since the trails are rough and wind through and over volcanic rocks and boulders. We wandered around a bit in Old Town Albuquerque - above is at the famous church, San Felipe de Neri built in 1706. We stayed one night at Los Poblanos - both an operating farm and lodging. The food in their farm-to-table restaurant was quite amazing. We managed to cram quite a bit into the short trip - which also included a breakfast in Santa Fe, where Katie's sister and her husband live. Rain Before End Of March? As the final week of March approaches global models forecast a bit of a chance for another light precipitation event for southern Arizona. Graphic above shows the 23 March 06 UTC GEFS plumes for rainfall at the Tucson airport. But there seems little hope that we'll have a significant, ground-soaking rain before Easter. This would make about six weeks since our mid-February significant rains. 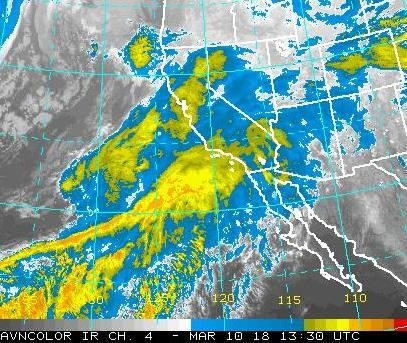 Cyclone over the Pacific is bringing a moist atmospheric river to California and well-inland today with heavy rains occurring. 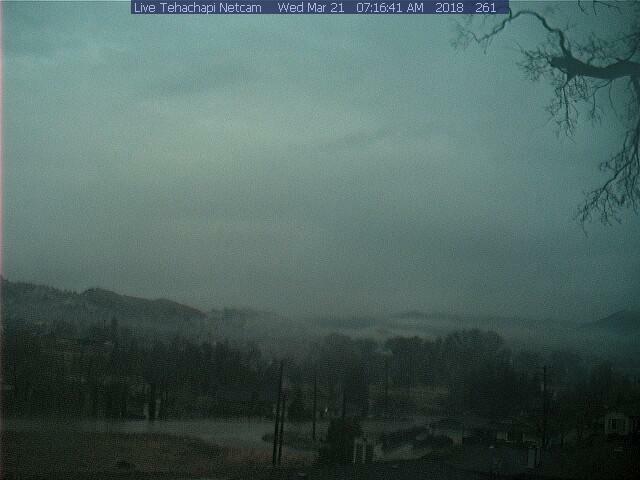 Image above is current view of Tehachapi, California. In the east a developing coastal storm has brought heavy snows to the D.C. and the central Atlantic region, which will spread northeastward. View below is current image of the Capital - which is obscured by the snow. 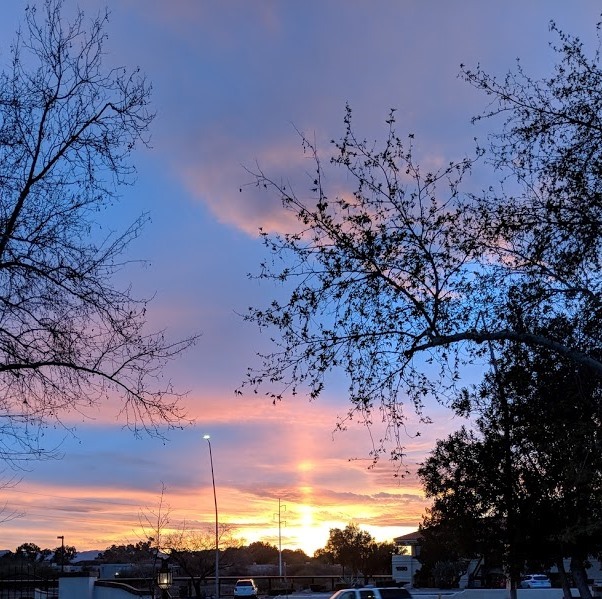 There was a very colorful, but partially broken, sun pillar at sunset on Friday the 16th. Katie took these images with her cell phone from Campbell and River. Updated Monday morning, 19 March - Yesterday's weather "event" played out as expected, with mostly light sprinkle showers and Traces of rain around the area. Plots above and below show 24-hour precipitation ending at 7:00 am MST this morning (top from ALERT and below from MesoWest). Just a couple of gauges with measurable precipitation, mostly in and near the Catalinas. The GEFS forecasts are now trending toward dry for this week - so it goes. Cold front is approaching this morning with attendant band of cloudiness. 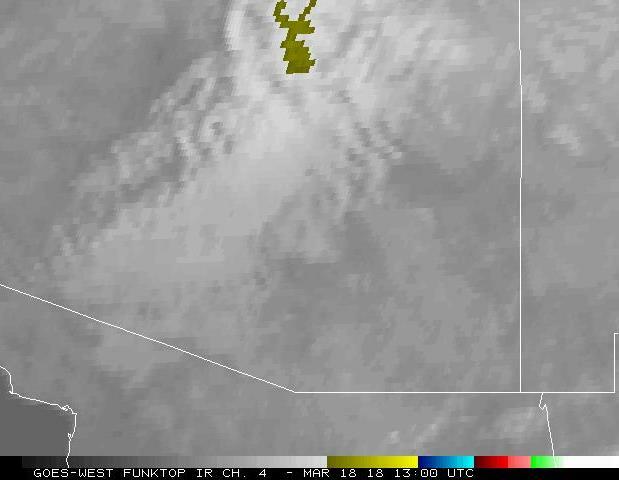 The IR satellite image above (from 6:00 am MST) shows this cloud band across southern Arizona. The MIMIC PW analysis below (also from 6:00 am) indicates a slight increase in PW associated with the band, but with amounts that are very low - around a half an inch or less. As the front crosses the metro area this morning the 06 UTC WRF-GFS forecast (below - precipitation through midnight tonight) indicates sprinkles across the metro area. The blues range from a Trace to around a quarter of an inch. Main impact of this system will be briefly cooler temperatures, and then we'll await next system toward end of new week. We have been away this past week on a road trip to northern New Mexico. The main weather word for the trip was "wind" and I'll cover that in a later post. View above is of the sparsely snow-covered southern end of the Sangre de Cristo mountains (looking north-northwestward from Pecos, New Mexico). Significant drought continues over much of the Southwest and Spring snow cover in the mountains is well below normal. This weekend another short wave at 500 mb will be crossing the Southwest - below are four panels from the GEFS run at 00 UTC last evening showing the forecast of this feature over Arizona at 12 UTC tomorrow morning (Sunday). The 06 UTC GEFS QPF plumes for TUS (above) indicate a slight chance for light showers with this system tomorrow morning, and perhaps another system on the horizon at the end of next week. The plumes for PW (below) show the current system to be quite starved for moisture, while the models try to pick up a Pacific moisture plume in the forecasts for the end of the week. At the bottom is the 06 UTC WRF-GFS forecast from Atmo - shown is that model's dismal forecast for precipitation through 06 pm MST tomorrow for southern Arizona, with the weekend precipitation confined to higher elevations of north and east Arizona. 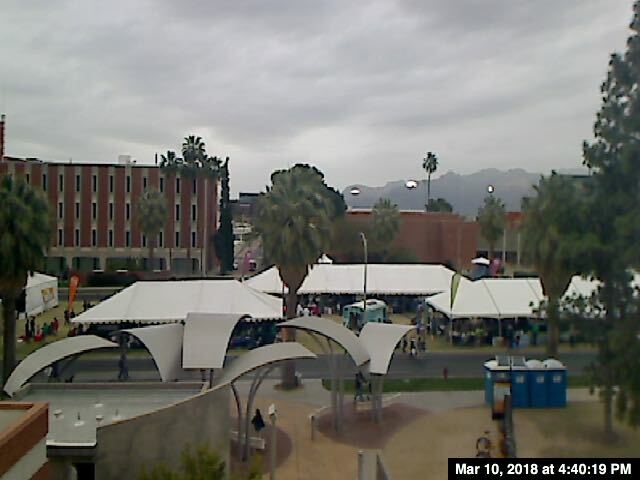 Folks at the Book Festival were mostly under the tents late in day yesterday, as sprinkles moved in after 3:00 pm MST. All the various models I looked at yesterday were off considerably - especially with their trend overnight for a wetter event. Sadly, the GEFS back on March 8th was much better, with a consensus QPF for airport of a Trace to around .02". None of the ASOS sites in southeast Arizona had recorded more than a Trace when I took a look at 6:00 am this morning. ALERT measurements at that time (above) had only Mt. Lemmon (and Keystone Peak) stations with 0.04" or more. The MesoWest local plots an hour later (below) indicated a few spots with measurable precipitation. We had 0.01" here at the house. Best ensemble forecasts yesterday morning for this "event" were the dry outliers in the plot from the SREF forecasts shown in previous post. During the night forecast models have picked up the substantial moisture plume headed our way from lower latitude,s and become wetter for tonight's precipitation. The 13 UTC MIMIC TPW (above) shows values around an inch already creeping into southwest Arizona. The analysis also picks up two cyclonic circulations that are heading northeastward - one is near 26 W just north of 30 N and the other is near 133 W just south of 30 N.
The 1330 UTC IR satellite image below indicates how substantial the cloud/moisture plume is - extending far to the west-southwest and reaching below 25 N. The Yuma NWS radar (KYUX - second below) is already detecting light showers over southwestern AZ. Note - the small, bright red echo between Mexicali and San Diego is return from a wind farm just south of the border. The model forecast plumes have also become wetter during the night - above shows QPF plumes for TUS from the 09 UTC SREF run and is from the plume-viewer at SPC. The spread is fairly large for tonight's event, ranging from a Trace to almost half an inch. The means are similar for both the GEFS and SREF plumes - around 0.15". Forecasts are basically for a light rain event at low elevations, but one with essentially 100% coverage. The graphic below shows the changes in the plume mean for the last four forecast runs of the SREF (color code for run times at top right). The runs yesterday were quite dry, but the two runs after 00 UTC have become considerably wetter. Finally, a look at a couple of forecasts from the 06 UTC WRF-GFs. Above is forecast skew-T for TUS valid at 06 UTC tonight. The sounding is forecast to be deeply moist, with over an inch of PW - very substantial changes between now and then. Below is model forecast of total precipitation through 06 UTC tomorrow morning. Impacts for the Book Festival - much of which is outdoors along the University Mall - will be a damp and cool morning tomorrow, with perhaps some lingering light showers. Will showers develop before today's events wind down? That's a close call and we'll just have to watch.